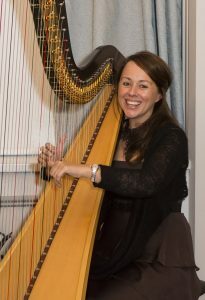 Amanda started playing the harp when she 6 years old after being mesmerised by Harpo Marx on tv. After many years of requesting a harp, she finally arrived home from Brownies to her wish…. 1992 Accepted into Wells Cathedral Music School where she was the first harpist to obtain a scholarship as a specialist musician. 1995 Won the Nansi Richards Scholarship. 1995-1997 After turning down a place to the Royal Academy, London, her studies continued at Cardiff University with Caryl Thomas where Amanda gained her BMus Hons Degree and LRSM. 2000 Accepted on to Yehudi Menuhin’s Live Music making her debut at the Purcell Rooms, London in 2002 and St Davids Hall, Cardiff, with Joanne Thomas in January 2003. Following on from Live music now, Amanda worked for many years with Lost Chord, a music charity which takes live music to dementia patients. She continues to support the charity and advises on training new musicians. 2013 Gained a Masters in Jazz from The Royal Welsh College of Music and Drama, Cardiff…a first for a harpist! 2016- Amanda became the Jazz harp tutor for the RWCMD and Birmingham Conservatoire. Over the last 10 years, Amanda has performed at countless concerts across the country and abroad, including the South Bank in London, St David’s Hall in Cardiff and cruise ships. Concertos have included flute and harp (Mathias and Mozart) Debussy Danses to name a few. 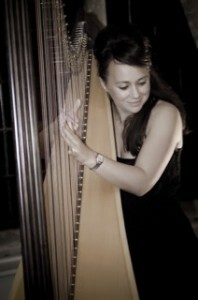 In April 2010 Amanda was invited to perform a concerto (Danger Zone), written and directed by legendary Jazz harpist Deborah Henson Conant, at the Caernarfon Harp Festival. 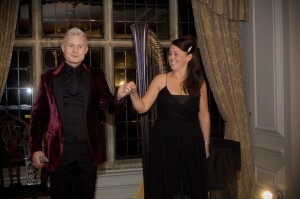 In September 2010 Amanda was the resident harpist at The Ryder Cup at the Celtic Manor Resort in Newport, Wales. 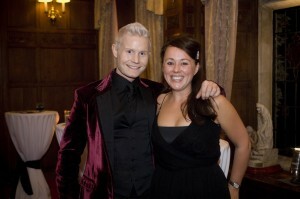 During the week she performed an intimate concert with X Factor’s Rhydian. Amanda has appeared on British, Japanese and Sky television, played on various cruise ships and has performed for HRH Prince of Wales, Reverend Desmond Tutu and the Archbishop of Canterbury. In 2012 she appeared in the Millennium Centre, Cardiff and the Hay Festival as well as performing regularly at Le Manoir in Oxfordshire, The Orient Express and other exclusive events. 2013-present has seen the launch of two new CDS Butterflies (with her jazz trio “The Whiting on the Wall”) and Memories (a nostalgic CD of well known songs) as well as five books for harpists and a Masters in Jazz.